Islam Around Us: LoC firing in Kashmir today . 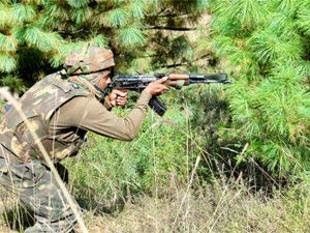 Gunbattle between Army, infiltrators enters 13th day. SRINAGAR | 06 Oct 2013 :: The Army operation against the holed up militants in Keran Sector along the Line of Control (LoC) in Kashmir today entered the 13th day with intermittent gunfire being exchanged. "The operation is still in progress. No fresh casualties have been reported on either side so far," defence sources said. Intermittent firing between the group of holed up infiltrating militants and the Army continued as security forces maintained a tight vigil over the cordoned off area, they said. The Army launched a massive anti-infiltration operation in Shalbhatti village in Keran Sector on September 24 after noticing a group of 30 to 40 militants trying to sneak into the Valley. The operation is going on in a vast area along the LoC and so far seven militants have been killed -- three in Gujjardoor village on Friday and four in Fateh Gali area of the sector yesterday. Earlier, the Army had said 10-12 militants were believed to have been killed in Shalbhatti village but the bodies could not be retrieved as the operation against the remaining militants was in progress. Five soldiers have been injured in gunbattle. The Army has termed as "absurd" the reports about capture of some posts by the infiltrators, saying the troops are in total control of the operation.